Notions > Elastic Knit 3/8"
This elastic has an improved quality over other brands that can be visually seen and experienced Soft comfortable next to skin. Will not narrow when stretched. 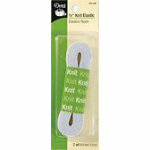 Use in casings or stitch directly onto fabric. Size: 38" 9.5mm. 2 yard package. 4 packages per box. Purchase by the box. First Available June 2010.